Key PR industry figures have thrown their weight behind a controversial campaign that aims to cut PR spam. 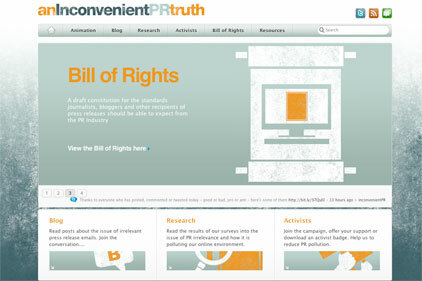 The campaign, named An Inconvenient PR Truth, includes a ‘bill of rights', which is a list of demands on behalf of journalists and bloggers about how they want to be approached by the PR industry. The first ‘right' is entitled ‘permission required' and asks that press releases are only sent to recipients who have given express or implied permission. Other rights include that press releases are sent in a timely manner, that PROs read the targeted publications first and that after a recipient receives a press release, a PRO should not follow it with a call. Borkowski founder Mark Borkwoski, Speed Communications MD Stephen Waddington and Umpf founder Adrian Johnson are backing the campaign. The campaign was launched yesterday by Realwire chief executive Adam Parker. The campaign includes new research that has found 1.7 billion irrelevant press release emails are estimated to be received in total each year by UK and US journalists alone. Some 78 per cent of press release emails are received by recipients to whom they are irrelevant and more than half (55 per cent) of recipients have taken action to block a sender of news.